At the Threshold Of Darkness, Redemption Awaits.It is 1772 and the world is at war. Or so it seems to Toma Nicolescu, a highly ranked warrior for the Russian Army. By order of the Empress Catherine herself, Toma has been dispatched to Moldavia to protect two women who are pivotal to Russian interests in the region. The twins Lucine and Natasha Cantemir must come to no harm.Toma's loyalty to his Empress is without question, but when he meets Lucine he is shocked by the feelings her beauty awakens within him. Putting duty first, Toma forsakes his heart and confesses nothing to Lucine. But the duke Vlad van Valerik has noticed her as well. Vlad is handsome, wealthy, and seems to enchant all who surround him. Including Lucine.Toma travels to Vlad's estate to learn more about the man ... and to rescue Lucine if necessary. There Toma witnesses things that baffle and unnerve him. The entire castle is pulsing with an incredible sense of freedom, yet there is something darker at play. A palpable evil.Fighting for the life and soul of his true love, Toma enters into a battle that has raged since the dawn of time. A battle where in order to win you must surrender. And to live, you must first die. 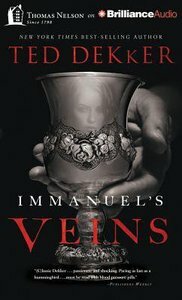 About "Immanuel's Veins (Unabridged, 8 Cds)"